On June 1, 1990, less than a week after graduating from college, future best-selling children's book author Mo Willems embarked on a yearlong trip around the world. Traveling with only a notebook, pen and ink, and one change of clothes, he spent the next welve months backpacking across twenty-eight countries. Each evening, he would sit and draw a funny or touching event that had struck him that day. The cartoons feature everything from the debauchery of the running of the bulls in Spain to the Malaysian custom of burning cardboard appliances for your loved one's afterlife – all priceless details that would never be found in an ordinary travel guide. 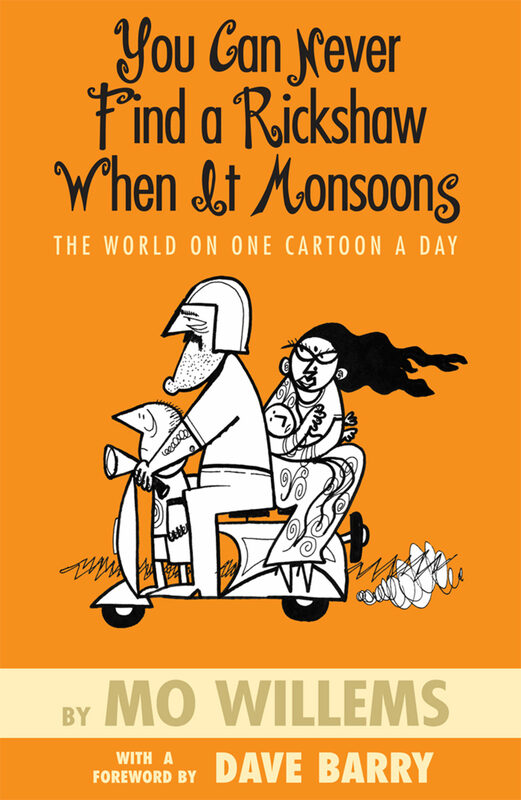 Recently annotated by the illustrator and featuring a foreword from best-selling humor writer Dave Barry, YOU CAN NEVER FIND A RICKSHAW WHEN IT MONSOONS is a unique snapshot of an artist's coming-of-age as he tries to understand the world around him.